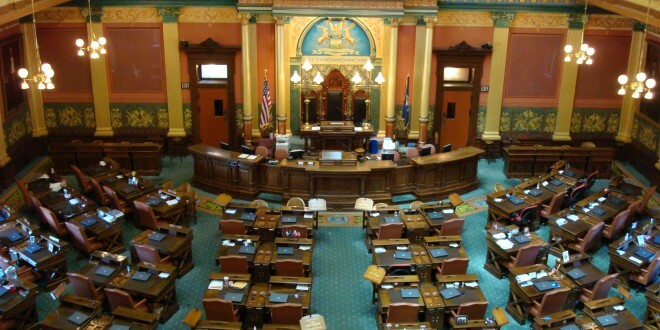 The State of Michigan has a “full time” legislature, which means they are in session year round. Each legislative session lasts for two years and we are currently just over 60% of the way through the 2015-2016 session. More on the legislative process here. In the first 14 ½ months of the current legislative session, close to 150 firearm related bills have been introduced in the Michigan Senate and House. The following are the most relevant ones. Editor’s note: Each of the bill names is a link to the actual Michigan registry for that legislation. It includes the various action dates and a link to the actual legislation. We are not lawyers and can not interpret the law for you. That is the job of your attorney. HB 4013: (Kelly-R) Personal protection order exemption to concealed pistol free zones (28.425o). Status: In House Judiciary Committee. HB 4076: (Rendon-R) Penal Code reference cleanup. HB 4152, 4153, 4154, 4155, 4156 & 4295: (Sheppard-R, Franz-R, Roberts-R, Cole-R, Barrett-R & Dianda-D) Redefine “firearm” to exclude pneumatic firearms and amend sentencing guidelines. Status: Enacted into law (PA 22, 23, 24, 25 & 26 of 2015). 4295 in Senate Government Operations Committee. HB 4159 & SB 516: (Johnson-R & Jones-R) Exempt certain corrections, probation, and parole officers with firearm training from concealed pistol free zones (28.425o). HB 4160 & 4161: (Johnson-R & Hughes-R) Define “Brandish” and allow for self-defense. HB 4261 & 4262: (Schor-D & Hoadley-D) Add libraries and prohibit openly carried pistols in concealed pistol free zones (28.425o). HB 4339 & 4340: (Courser-R) Repeal pistol registration. HB 4419 & 4420: (Kurt Heise-R & Gay-Dagnogo-D) Repeal 2 year mandatory minimum sentence for possession of a firearm while committing a felony. Status: Recommended out of House Criminal Justice Committee. Sitting on House floor. HB 4535: (Theis-R) Exempt members of law enforcement from requirement to obtain a license to purchase, possess, carry, and transport a pistol. HB 4564 & 4565: (Dainda-D) Modify firearm transport requirements to allow unloaded firearms to be transported in a vehicle without being broken down or encased. HB 4590, 4591 & 4592: (Townsend-D) Extend License to Purchase (“Purchase Permit” RI-010) process to long guns. Creates so called “universal background checks”. HB 4593: (Hughes-R) Exempt veterans from CPL licensing fee. Status: In House Appropriations Committee. HB 4675 & 4676: (Chatfield-R) Make pistol registration optional and provide for deletion of records upon request. HB 4772, 4773, 4774, 4775, 4776 and 4778: (Gamrat-R) “Constitutional Carry” package. Permitless concealed carry, transport, and possession in certain areas (750.234d). HB 4795: (Chatfield-R) Provide for punishments and reimbursement when local units of government violate preemption. Status: In House Local Government Committee. HB 4846: (Barrett-R) Exempt members of the military, including National Guard, from concealed pistol free zones (28.425o) while in uniform. HB 4876: (Roberts-D) Prohibit flamethrowers. HB 4942 & 4943: (Wittenberg-D) Create gun violence restraining order. HB 4944 & 4945: (Townsend-D & Chang-D) Allow listed entities to prohibit openly displayed firearms. HB 5045: (Dianda-D) Allow County Clerks to waive CPL licensing fee for retired law enforcement, retired corrections officers, and veterans. HB 5195 & 5196: (Hoadley-D) Penalties for storing firearm accessible to minor. HB 5199, 5200 & 5201: (Chatfield-R) Allow pistol storage in a vehicle where not readily accessible and eliminate concealed pistol free zones (28.425o). HB 5301, 5302, 5303 & 5304: (Chatfield-R, Barrett-R, Runestad-R & Cole-R) Permitless concealed carry. HB 5357 & 5358: (Licido-R) Permitless concealed carry with disclosure. HB 5443: (Wittenberg-D) Prohibit firearm purchases to individuals on federal terrorist watch list. 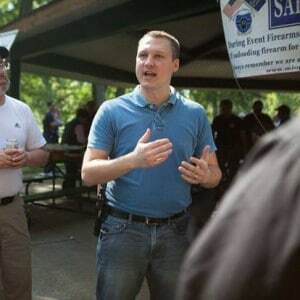 Tom is the President and Legislative Director for Michigan Open Carry, Inc., and an NRA Certified Instructor. Michigan Open Carry, Inc. is the premier organization in Michigan promoting the lawful open carry of a holstered handgun. Through positive ambassadorship with open carry, MOC seeks to enhance all gun rights related to carry for self-defense for everyone. Previous Hey, I just bought an AR15. What should I add next?